Ancient Stones - Borders - 047 Peden's Pulpit, Gameshope, Tweedsmuir. 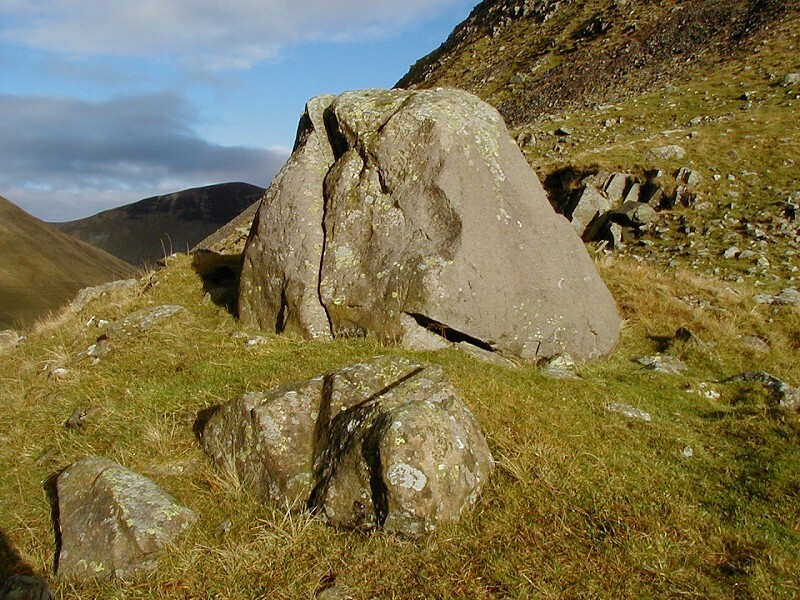 Somewhere along the course of the Gameshope Burn near Talla Reservoir, in the Tweedsmuir hills, there stands a massive boulder named Peden's Pulpit, which recalls the name of Alexander Peden, the Prophet, one of the greater figures in covenanting history. No details were available to the exact location of this site, nor if it actually exists at all and the stone featured here may not correct. A History of Peeblesshire by J. W. Buchan and Rev. H. Paton, Published 1925-7, records, "Peden, 'the Prophet,' still has a memorial in 'Peden's Pulpit,' a boulder up Gameshope Glen." From the A701 Penicuik to Moffat road, turn onto a minor road at Tweedsmuir village. Continue along this road, pass Talla Reservoir to the farm at Talla Linnfoots. Then, on foot, or if very fit, by mountain bike, follow the trail south up the valley of the Gameshope Burn. Note, the going is very rough. The boulder shown is on the left as you walk up the valley. A large modern pile of boulders lies nearby, marked with a small tree. By verge at head of Talla Reservoir. The problem with this location is the lack of accurate details. G. Rae's 1948 book, Historic Haunts of Peeblesshire, refers only to "Games Hope" and the valley is littered with hundreds of large rocks and glacial boulders. Finding a likely stone is difficult, if not impossible and unless some local knowledge or other information some to light, the exact location of this stone will probably remain a mystery. There is also the possibility that a specific stone does not exist and that the reference actually refers to an area of ground where Peden preached to his followers. It might be more a case of looking for a likely location rather than a single boulder. The location shown here is my best guess at such a place. An early morning return visit to Gameshope valley, this time on a bright but frosty October morning, gave me the opportunity to thoroughly explore the valley. There are many large boulders in the area but none seem to fit the bill as well as my original selection. The area immediately around the stone is well suited for preaching to a crowd of people with the ground being reasonably well drained and flat. It was also interesting to note that a few small quartz pebbles have been placed on the stone, perhaps giving some credence that the stone may actually be Peden's Pulpit, as referred to by G. Rae. Of course, it might also mean the boulder has some other ritual significance? A large crack in the stone holds a large bone, possibly that of a sheep, or perhaps something more sinister?